Info: 3 Bedroom, 3 Bath Resort Property, Sleeps 6. Fantastic Bel Sole condo with magnificent water-views from the private balcony, master bedroom and guest bedroom – the spacious balcony overlooks Little Lagoon and Beach Blvd. The fully equipped kitchen in the Gulf Shores Alabama vacation rental home includes granite counter-tops, stainless steel appliances & wet bar with an ice-maker. The master BR in this VRBO property has a walk-in closet and the bath includes a jetted-tub, double-vanity & separate, walk-in shower. The 2nd BR has private bath with large shower, the 3rd BR has twin-beds, excellent views. Washer/dryer room with laundry tub. This resort rental home by owner has been updated throughout. The amenities at Bel Sole condominium include indoor and outdoor pools, a fitness facility, hot-tub, private beach access and a pier with boat-docks. Secured access to the property is via coded elevators. 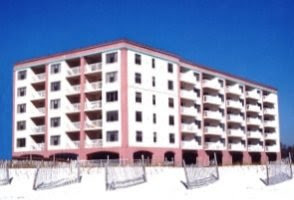 Gulf Shores Alabama is a popular family beach vacation destination, the warm climate allows for an abundance of outdoor activities, dolphin cruises, championship golf courses, bird-watching, deep-sea fishing charters and nature hikes. for accommodations, choose from national hotel and motel chains, camping or a variety of beach homes for rent by owner and/or management companies. There are numerous venues for nightlife, from family entertainment to a legendary roadhouse, enjoy from a selection of plays, concerts, dancing or just relaxing while listening to local musicians.When hunger strikes, enjoy one of many Gulf Shores eateries offering some of the best seafood anywhere…fried, grilled, steamed, blackened, etc. Whether you’re ready for fun and adventure, a carefree day on the beach, fresh seafood or your own Gulf Shores beachfront condo – you can find it all on Alabama’s Gulf Coast.